to see full view in separate window. larger images to screen size. some geology and history-related photos.  II: Long and Raspberry Islands.  IV: Michigan and Sand Islands. 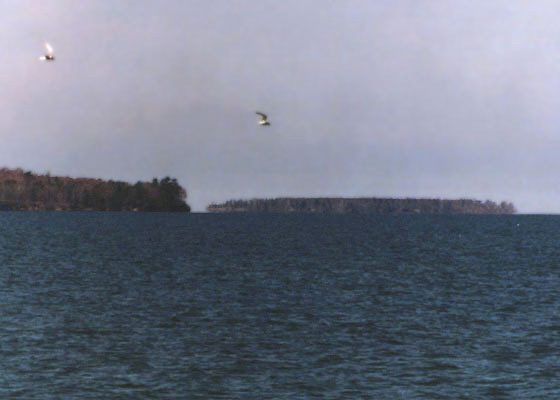  VI: Madeline Island in October, 2004. 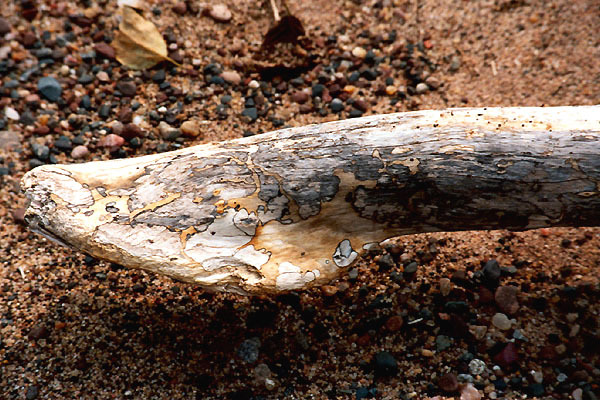  VIII: Lake Superior Shoreline Photos.  IX: Gull & Eagle Islands and Siskiwit Falls. 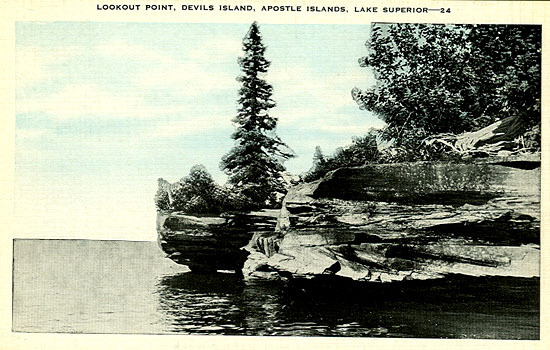 For comparison, an excellent present-day map of the Apostle Islands can be downloaded from this page. Henry Schoolcraft's Summary Narrative of an Exploratory Expedition to the Sources of the Mississippi River (pub. 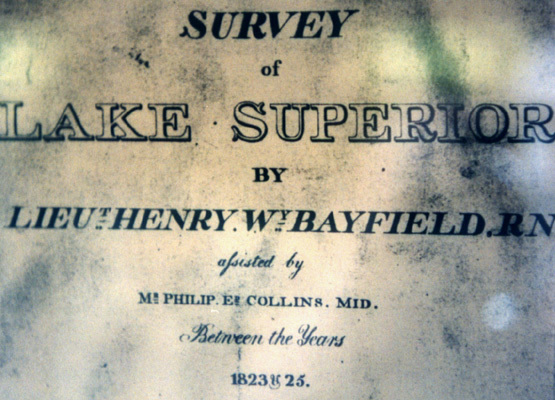 1855; listed here) summarizes and tabulates his journals and other notes taken during his major expeditions into the upper tributaries of the Mississippi River in 1820 and 1832 (and a less significant foray in 1831). 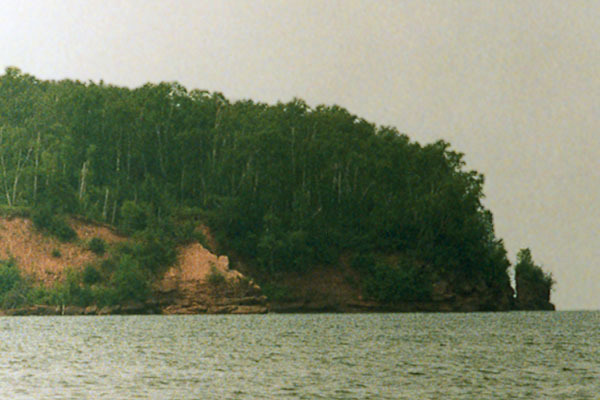 An important stopover place on these journeys was Madeline Island of the Apostle Islands group. 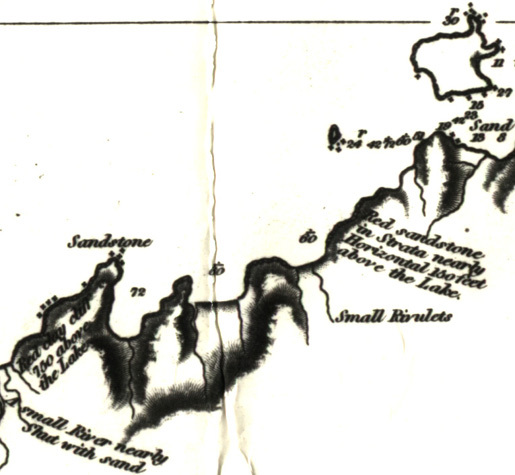 Schoolcraft's determination that the number of Apostle Islands matched the number of states of the Union at the time is reflected in his 1820 sketch where he gives each island the name of a state and dubs the entire group the Federation Islands. The direction arrow actually points toward the west-northwest. Especially notable on the map is a significant commerce trail to the southwest which is also seen as "Mail route" on Maps 13 and 13A on the first page of the old maps. Modern-day views of this road are shown here in Photos 24-26. According to Schoolcraft's narrative, the name "La Pointe Chagoimegon" refers to the tip of the continuous peninsula. 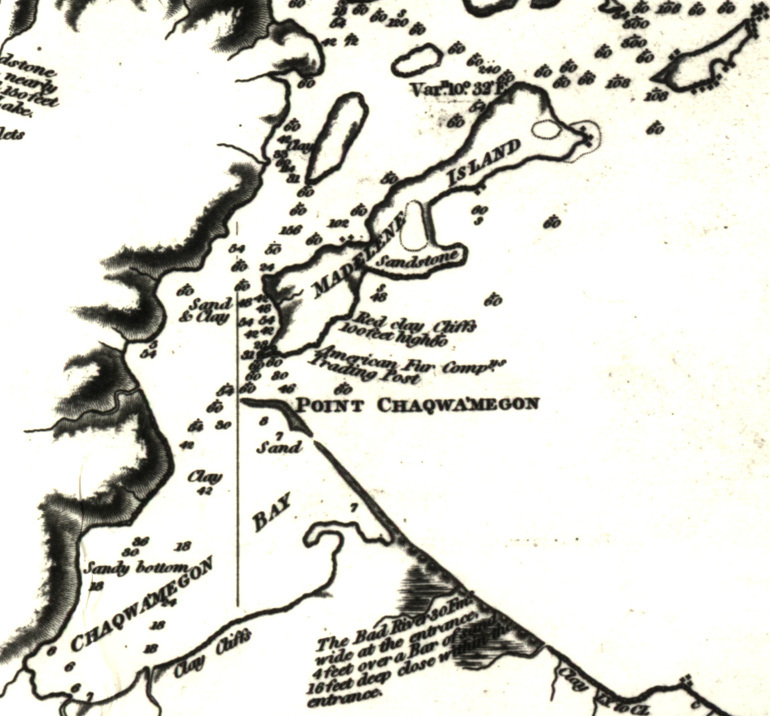 "Chequamegon Point" applies to the entire peninsula on more modern maps. The distal, several-mile-long portion is occasionally detached from the mainland (not so today) and appropriately referred to as Long Island – a name that happily persists for that area whether or not it is separated. 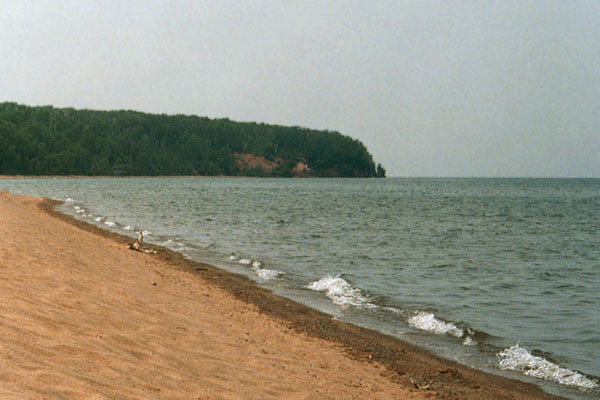 This particular sand spit has been gaining land on the northern side and losing it on the other – slowly inching its way in the direction of Madeline Island. On a clear day it and some of the more northerly Apostle Islands can be seen from the summit of St. Peter's Dome, approximately 23 miles to the south. 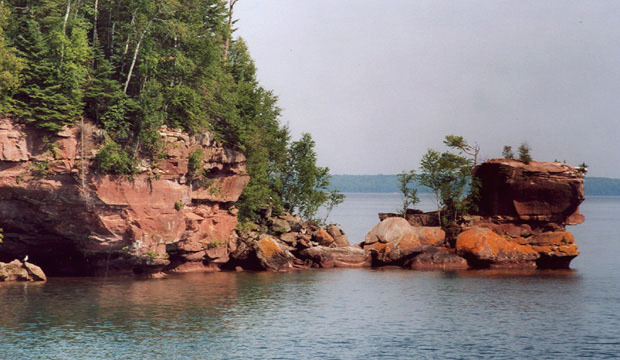 The village of La Pointe on Madeline Island takes its name from the proximity of its first location to "La Pointe Chagoimegon." On Schoolcraft's map, "Virginia," "Illinois" and "Minnesota" represent Madeline, Basswood and Hermit Islands respectively. 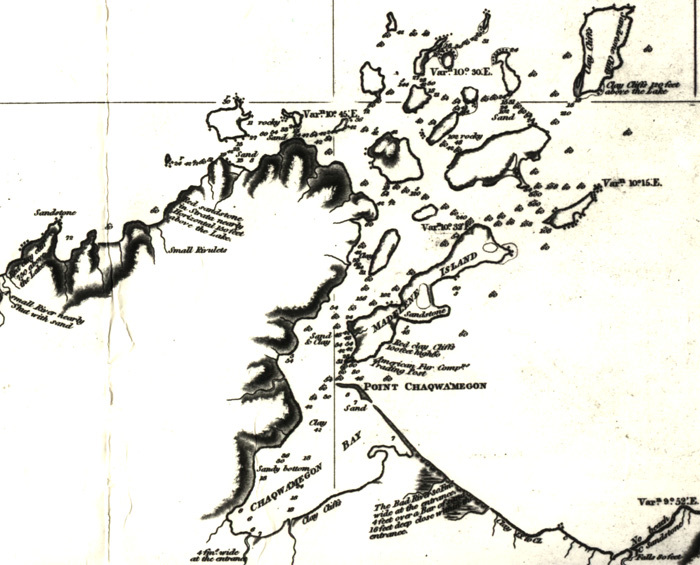 It is difficult to recognize all of the islands that we know today from Schoolcraft's sketch, but at least some of his "extraneous" islands could have been present in his time but only exist today under water or perhaps joined to other islands. Between and around the present-day Sand and Devil's Islands exist four shoals which may have been above water according to the book by Hamilton Ross (listed here and below) where the shoals are named after the nearby Sand, York, Bear and Devil's Islands. Unfortunately none of these appear to help in interpreting Schoolcraft's map except to possibly explain the extended shapes of "Massachusetts" (Sand) and "Connecticut" (York) Islands. 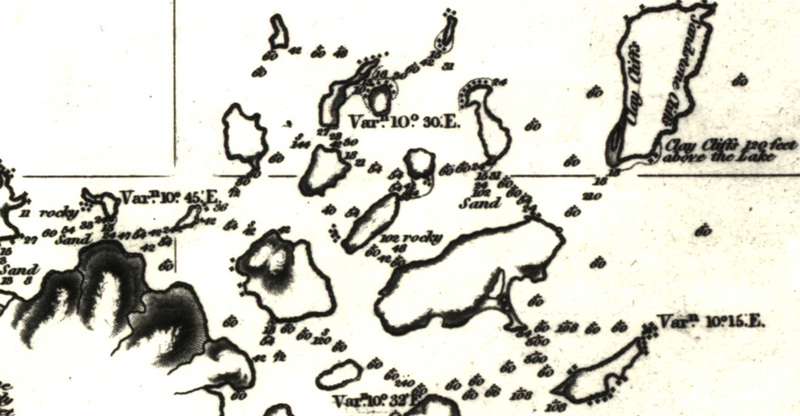 As Schoolcraft applied "Massachusetts" to what we know as Sand Island, it is then probable that the two small islands to the west that he called "New Hampshire" and "Vermont" match the present-day Eagle Island and the since-submerged Steamboat Island, respectively. In the 19th century, "Steamboat" was the popular name given to what has since become known as Eagle Island, the westernmost of the Apostles. One might actually think it appropriate given its appearance from the east where it does resemble a long steamboat, albeit without the smokestacks. (Click here.) 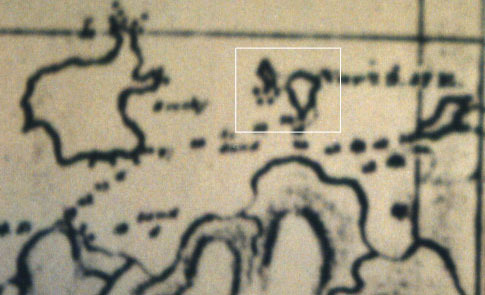 Map 16 (on the second page of old maps) which is dated 1875 appears to give the name to Eagle Island. 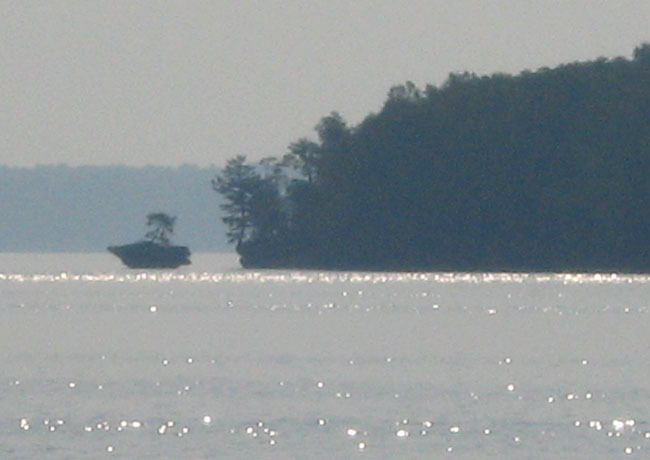 The nearby "Little Steamboat Island" (labeled as such on some old maps) became the "official" Steamboat Island as the Eagle Island name became established. Old platbook maps from the early 20th century – linked from the Bayfield County WIGenWeb homepage – use the older name for Eagle Island, but contemporary official nautical charts make a clear distinction between Eagle Island and "Steamboat Island (submerged)" as one can find on the Historical Map and Chart Project site. An example of such a chart is shown on our Steamboat Island page which includes a further discussion of the island's name and a photo from 1888 that has the main mass of the island looking like a sinking Titanic hung up on a sand bar! Parts of Bayfield's map in a little better detail, moving clockwise along the peninsula coast in the order shown here. Farther west on Schoolcraft's map is "Pt. aux Ecorce" which is translated as "Bark Point" and is still known as such today. Its shape on many older maps reminds my friend Kellie of a chilling poem she read years ago that describes a man's withered, creaky fingers grasping at things real and unreal. Beyond the end of the point, Schoolcraft puts an island labeled "Maine" where none presently exists. But wait! Perhaps the tip of that "creaky peninsula" was separated off as an island at that time! Before we get too critical of Mr. Schoolcraft's cartography, we should be aware of the dynamics of landform alteration in what could be quite a volatile region that may look considerably different 200 years from now due to shifting sandbars and coastal erosion. Swampy land that appears in the narrowest part of the Bark Point peninsula suggests a previous open water area that would have made the distal portion an island. Modern-day aerial views along the entire shoreline of Bayfield County are shown here. 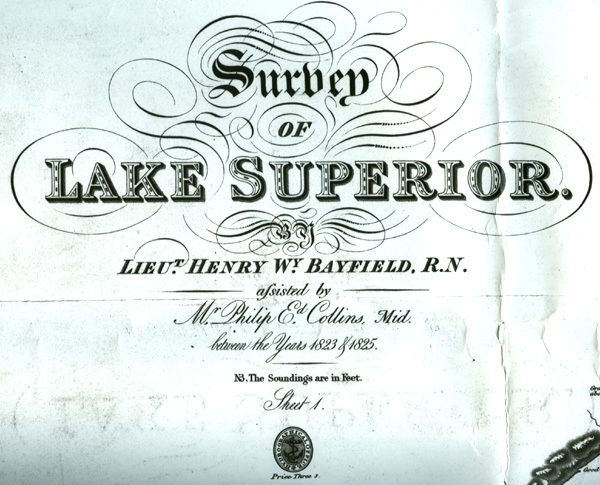 A precise survey of Lake Superior by Lt. Henry W. Bayfield in 1823-25 resulted in a map of the islands that is very accurate by today's standards and is shown here for comparison. What we see here is a direct scan of a copy of that which we will call a "later-published" map – showing the publication date of June 18, 1828. Previously on this web page was a low-resolution photo of a copy of an earlier-published map on display at the Madeline Island Historical Museum. Clicking on the nearby three images will bring certain parts of the scan in better detail. Returning to the subject of "extra islands," the earlier-published Bayfield map shows York Island (Schoolcraft's "Connecticut") split into two; note the detail here. According to Strzok, the smaller western island was called "Rock Island" and it has since become connected to York by the buildup of a sand bar. 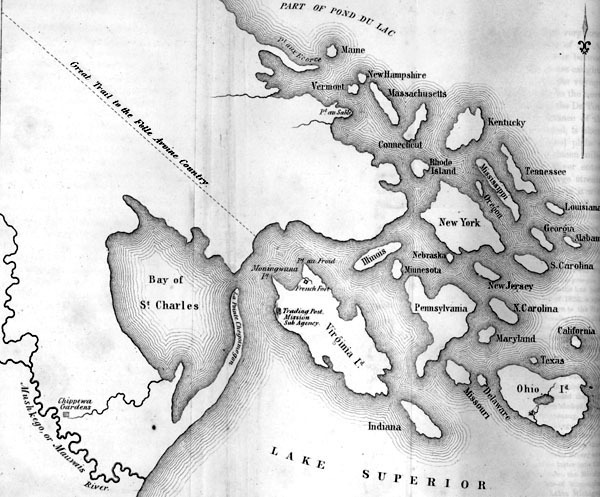 On the later-published map, Bayfield appears to have York Island intact as seen in the scan detail here. 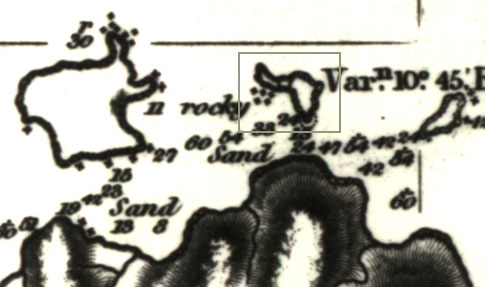 On both maps, Bayfield applies "rocky," "Sand" and "Clay" to describe the lake bottom at various sites, and a peculiar Cape Cod-like extension of Sand Island can be seen which does not appear on later maps (nor on-site today). Rocky Island (Schoolcraft's "Mississippi") appears on Bayfield's earlier-published map to be two islands (not so on the later), and at least one other map of the 19th century shows the entire Rocky Island joined with South Twin Island ("Georgia"); this is discussed and illustrated here. Asaph Whittlesey's legendary 1871 map titled Apostle Islands and Harbor of Bayfield and its Surroundings is shown here as part of the Wisconsin Historical Society's collection of historical maps, many of which are available for purchase. 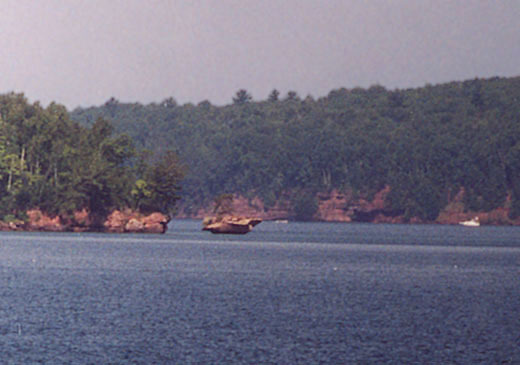 Some of the Apostle Islands are given the names of their owners – including Steamboat Island which is labeled "Chapman Island." Long Island is connected to the mainland and Little Manitou Island is not shown. 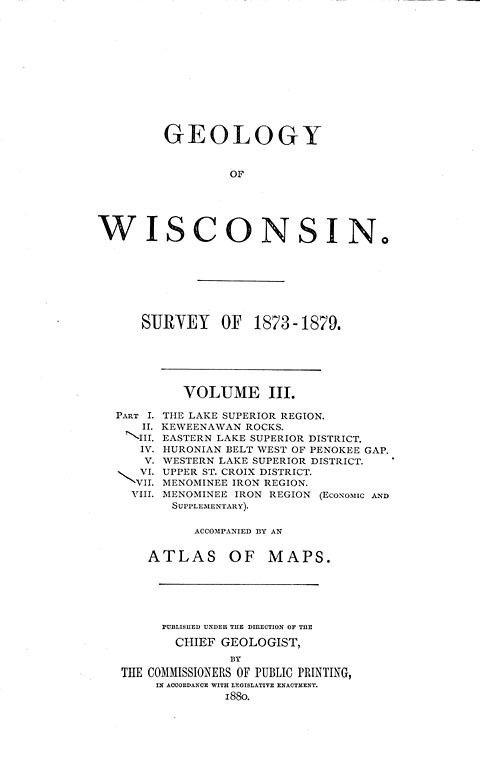 Volume III of Geology of Wisconsin – Survey of 1873-1879 (published in 1880), lists 24 islands including an unnamed "rocky islet between Steamboat and Eagle Islands [which] is only fifteen feet in diameter" and also Little Manitou Island – but not Long Island (connected to the mainland) nor any isolated sea stacks or arches. The Visitor's Guide to Apostle Islands National Lakeshore by Dave Strzok (2003; available at the Keeper of the Light in Bayfield, WI) provides some history of the area and (more importantly) authoritative guidelines for anyone who wishes to obtain maximum enjoyment of the islands – safely and with minimal impact on the environment. Regarding that last point, one can actually feel like a bull in a china shop in some of the more "delicate" areas. 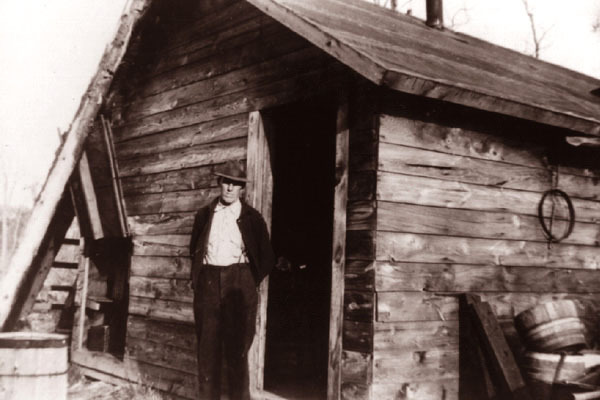 Extensive historical and geographical details about the Apostle Islands are given in La Pointe: Village Outpost on Madeline Island by Hamilton Ross – more about which is given here. 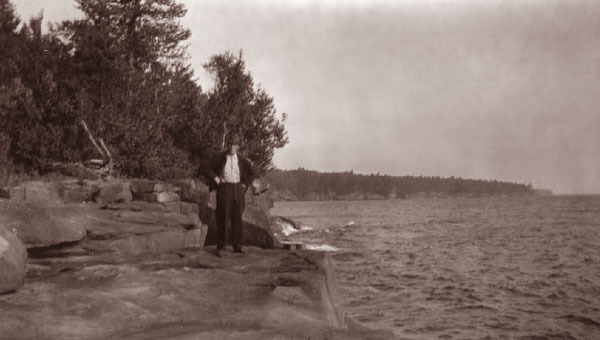 Geological details – including an analysis of each of the islands and how sea stacks and arches develop – can be found in A Guidebook to the Geology of Lake Superior's National Lakeshore by Edward B. Nuhfer (revised ed., 2004) which is full of maps, photos and diagrams and some descriptive poetry as well. One might hope that the next revision will include information on the submerged Steamboat Island about which the Strzok and Ross books have a few stories. At the bottom of our Steamboat Island page are a few links which may delight Great Lakes history enthusiasts. 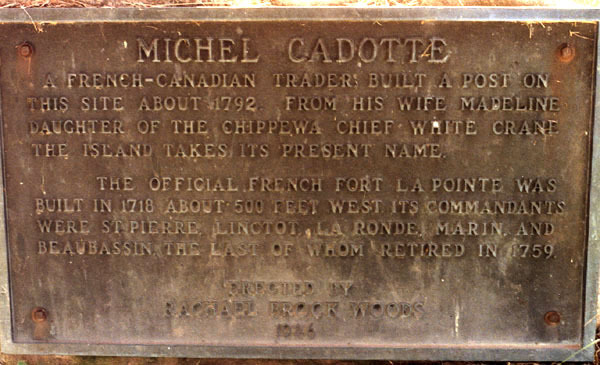 1–2: Site of a French-Canadian trading post built on the southwest end of Madeline Island around 1792 by Michel Cadotte. 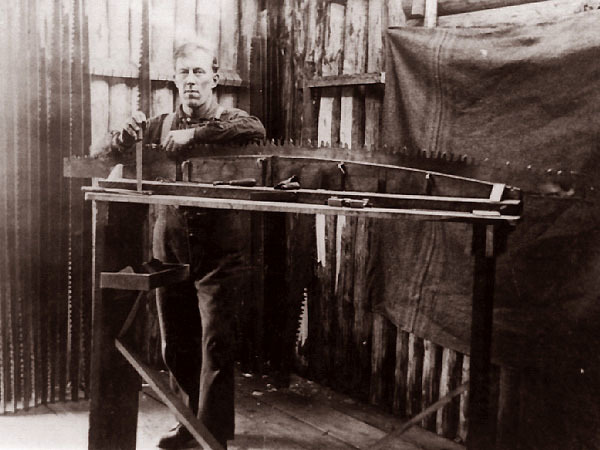 3–7: My grandfather Clarn Lindquist sharpened the saws at Schroeder's logging operation on Outer Island in the 1920s. 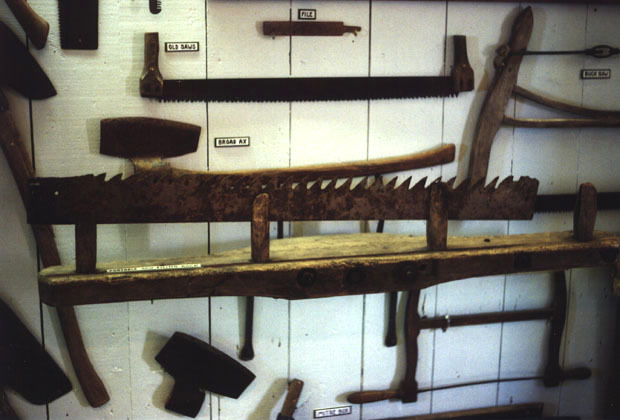 A saw filing rack similar to the one shown in Photo 3 can be seen among other logging equipment at the Madeline Island Historical Museum; click here. A photo of the Lindquist patriarch with his family in 1915 is on my home page. (The photos here were taken by his daughter, my late aunt Elsie, who visited him on occasion.) 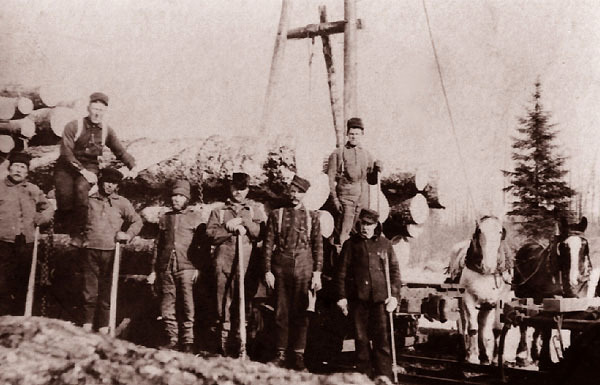 Present-day scenes of the Lullabye logging operation are shown on our Outer Island page here. 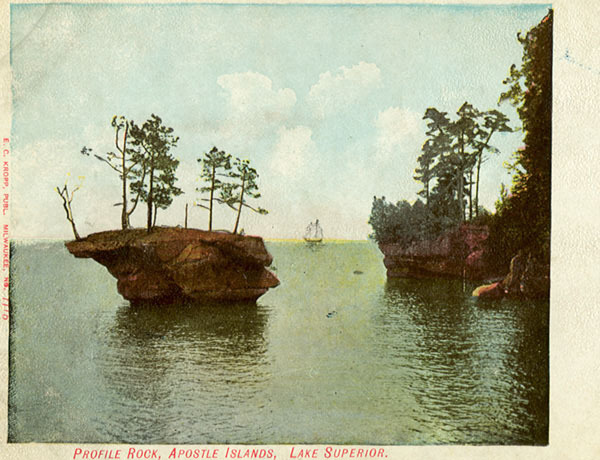 8: Interesting geological landforms among the Apostle Islands – many of which no longer exist – were shown in artistic fashion on many postcards from the 19th and early 20th century. Here we see a view of Devil's Island. 9: Castle Rock looks like an example of a "sea arch" which, according to Coastal Landform Definitions, is an "eroded remnant of coastal cliff, made up of two stacks joined at the top" – a "stack" being a "usually steep-sided, eroded remnant of coastal cliff." 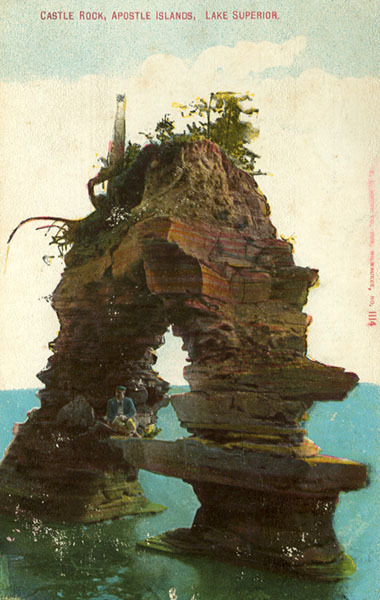 Hopefully its location among the Apostle Islands will come to light as I continue to examine collections of old maps and postcards. 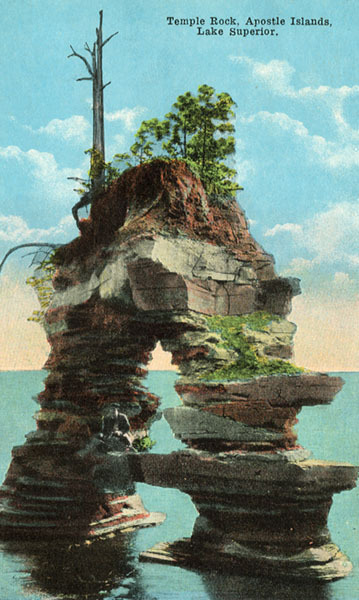 10: This postcard either shows Castle Rock in a deteriorated state, or it applies the same name to a different arch. 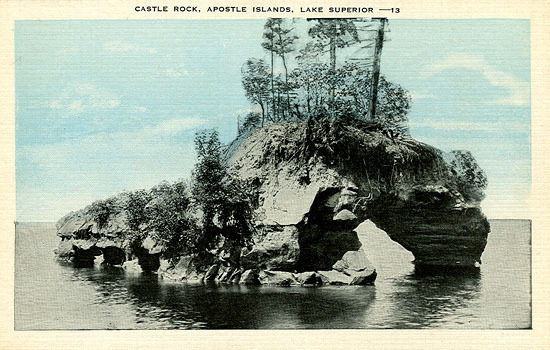 Apparently this Castle Rock was also known as Temple Rock and is labeled as such on the postcard shown here. 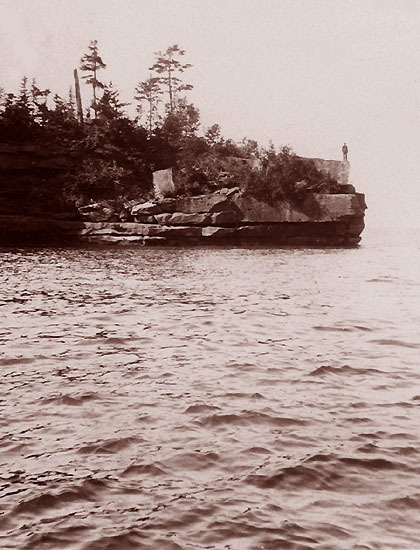 11–11A: Profile Rock is a sea stack located just off the north shore of Basswood Island and has also been called Lone Rock, Floating Rock and Honeymoon Rock – the last name being the one most commonly applied today. On a tourboat around the islands, this rock may be observed in the distance as we see here and here. It was thought . . . that when they were encamped on the island in front of the face that no harm could befall them. 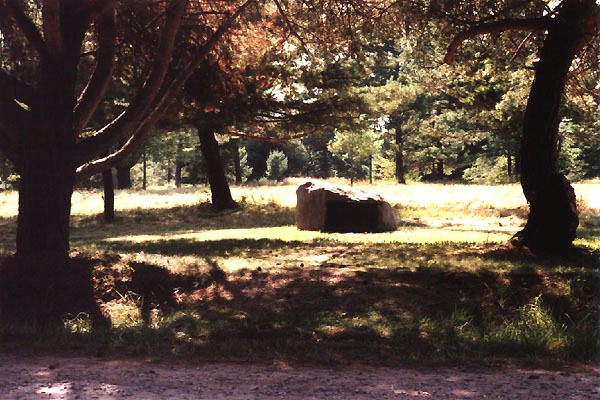 This belief had such a firm hold upon the Indians of this whole region that when a band of fugitives were hard pressed and likely to fall into the hands of their pursuers they would always fly to the protected camping grounds within sight of the Great Stone Face well knowing that no enemy would dare to molest them once they were there. Sea stacks and arches continue to be eroded by wind and waves, and Castle Rock may have worn away to a pile of rocks (perhaps now totally submerged) over the past century. 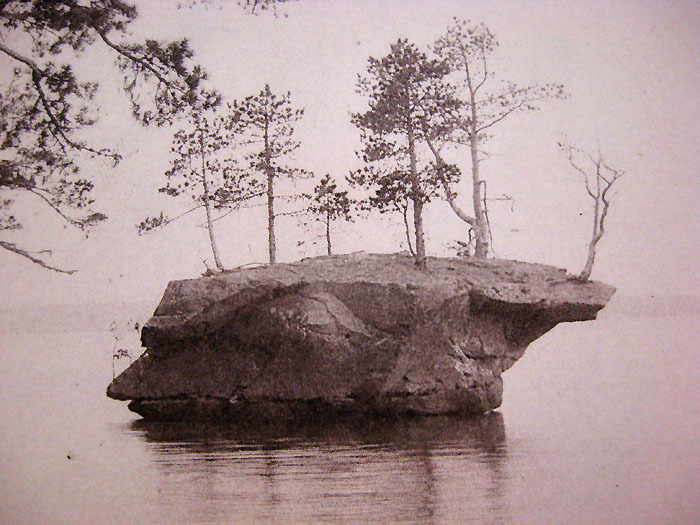 Such was the fate of the legendary Soldier's Rock of Madeline Island which is no longer visible. 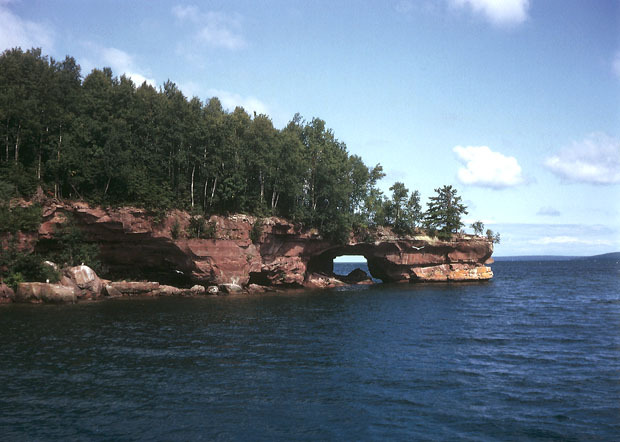 Web searches for sea stacks and sea arches in Lake Superior may reveal photos (old and new) of these and other interesting formations, and a photographic compendium of these features (extant and otherwise) is long overdue. It is not the intent of this website to provide such a compendium, but once one finally hits the web we will gladly link to it here. In the meantime, I would like to fill in a couple details not yet seen on the old postcards or in the relevant literature such as (1) where was the Castle Rock shown in Photo 9 located, and (2) what was the nature of the "rocky islet" (mentioned above) between the small Steamboat Island and its larger neighbor Eagle Island? Regarding the latter point, it is probable that all three were once part of a more extensive Eagle Island which continues to "fall apart" at its southern end today. 12–13: Here is Lookout Point on Hermit Island which collapsed in the Summer of 1975. These photos were taken in 1970 and 2006 and show a "before and after." Discussion and photos of its deterioration are found in the Strzok and Nuhfer books cited above. 14: This appears to be a developing sea stack on the south shore of Lake Superior as seen from the beach at Herbster, Wisconsin. A telefoto view is shown here. A small stack at Washburn, WI is shown here. 15: Extra Added Attraction: An interesting piece of driftwood found on the Herbster beach. Go to next page, menu.  More islands: Steamboat and Washington.  E-mail me at jlindquist 001 @ gmail.com . This page is best viewed at 640X480 or wider. All photos on these pages are by myself unless noted otherwise. This page was last modified on 3/7/14 at noon, CST. Spaces inserted into email address to discourage spambots. Please remove before using.